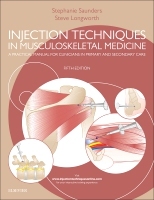 Welcome to the online Trainer for Injection Techniques in Musculoskeletal Medicine, 5th Edition, by Stephanie Saunders, FCSP, FSOM. Using case studies, the Trainer covers the top 10 injections commonly given in primary and secondary care for the relief of joint and soft tissue pain in six body regions — the shoulder, elbow, wrist/hand, hip, knee and foot. The Trainer tests knowledge of anatomical landmarks, differential diagnoses, assessment criteria, drug selection and technical skill in accurate delivery of the injection. The Trainer, used along with the book, will help you to deliver injections with both accuracy and confidence. The online Trainer is compatible with all devices, including tablets, such as Apple's iPad and Samsung Galaxy, and desktop computers.